Red Bull, British Airways and Pimm's are among the brands to be included in the Guinness World Records 2014 for their PR stunts. The latest edition of the book, which launches today, hands Red Bull Stratos the world record for most-watched live stream of all time. Last October's jump from the edge of space by Felix Baumgartner was watched by 8.3 million viewers live on YouTube. The campaign was handled by PR agency TVC. Global client service director James Myers said: "We led the broadcast and digital delivery of the project for almost five years and were on the ground at every milestone along the journey from 2007, to ensure fast and smooth delivery of Felix’s amazing story to media around the globe. "We take great pride in the fact that not only did Felix’s jump break countless records, both in space and in the media, it allowed Red Bull to rewrite the rule book in terms of what is best practice when it comes to brand content marketing." The British Airways in-house PR team is featured for its double record stunt undertaken to promote its sponsorship of Comic Relief 2013. It broke records for the highest concert, with performances from Kim Wilde and Tony Hadley, and the highest Harlem Shake, both of which took place at 43,000ft. A comedy event held by BA broke the record for highest comedy gig in the world in 2011. BA consumer PR manager Sophia Procter said: "In terms of engagement the stunts were a great success. Press coverage was immense and it was featured in half the national papers and some TV spots." 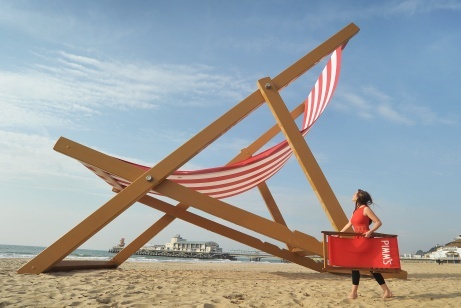 PR agency Grayling marked the official start of British Summer Time by creating the world’s largest deckchair on Bournemouth beach in a 2012 campaign for Pimm’s. MD of Grayling’s Brands division Tristan Pineiro said: "Pimm’s is synonymous with British summertime, which was integral to the deckchair creative. We set out to deliver a bold and disruptive stunt that would position the brand as champions of the Great British summer and put Pimm’s, quite literally, on everyone’s lips at the very start of season." The stunt generated 131 pieces of media coverage, including 13 TV spots and 14 nationals hits. Other brands featured for PR activities include eBay, which created the world's fastest milk float with a top speed of 77.53mph. De’Longhi created the world's largest cup of coffee (filled with 13,200 litres of De'Longhi coffee) to mark the end of British Summer Time and give London commuters a boost on their first winter journey. Nissan is included for the largest indoor illuminated advertising billboard at Dubai International Airport in February this year, with a surface area of 1,874 square feet.